Shhhh! Have you heard that “Purple Whisper Bench” by sculptor Jim Gallucci is Dearborn’s sculpture of the month in November? See the piece in West Dearborn’s Starbucks Plaza. Described as artistic, functional and fun, it’s one of 12 sculptures placed throughout Dearborn as part of the community’s 2013-2014 Art in Public Places – Midwest Sculpture Initiative (MSI). Funding for the project is provided by the Dearborn Community Fund (DCF) and the East and West Dearborn Downtown Development Authorities. Each month a different sculpture and sculptor are highlighted. Sculptor Gallucci enjoys creating pieces that are practical and engage the public in a way to invite interaction. “Purple Whisper Bench” is a good example of this. It allows visitors to whisper into the design’s tube-like structure on one end and be heard at the other end. A sculptor for more than 30 years, Gallucci designs and fabricates his sculptures at a 7,200-square-foot Greensboro, NC studio with the assistance of a six-member staff. Most of his works are commissioned for public, corporate and residential spaces around the country, but he also exhibits in prestigious shows like the famous Pier Walk Sculpture Show held annually in Chicago. His sculptures have also been selected for exhibits in Brisbane, Australia and Hakone, Japan. “Purple Whisper Bench” is priced at $8,000 and will remain on exhibit until late April 2014. The DCF is a 501c3 organization and gifts toward purchase of a sculpture for permanent public installation are tax deductible. 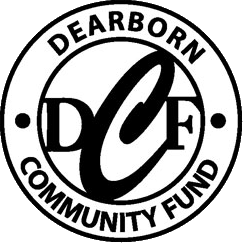 A portion of the purchase price supports DCF projects that benefit the Dearborn community. Want to visit other sculptures in Dearborn? Click here for an “I Spy Dearborn’s Art in Public Places” card with photos and locations of all 12 MSI 2013-2014 sculptures. For more information on the sculpture initiative, including price and purchase information for any sculpture included in the 2013-14 exhibit, contact the DCF office at 313-943-5478.